In a trading business we work out the value of our inventory by just looking at the supplier’s invoice and simply seeing how much it cost to buy the goods. In a manufacturing business we work out the value of our inventory by calculating how much it cost us to make the goods. So in order to calculate how much our inventory are worth and how much our cost of goods sold came to, we need to calculate how much it cost us to manufacture the finished goods. 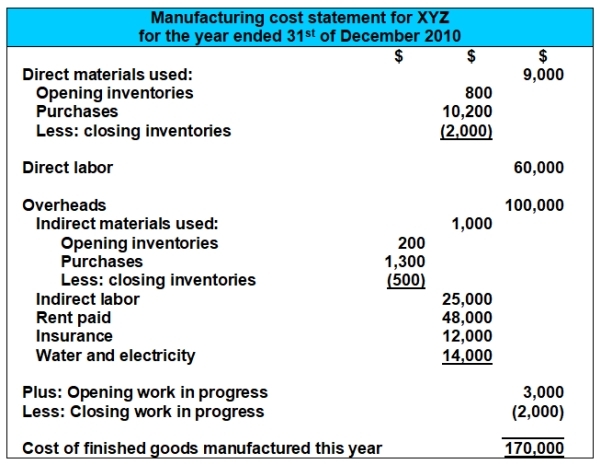 The manufacturing cost statement is a report showing the various costs involved when manufacturing finished goods. Note that although it is a formal (and important) report, it is not part of a business's annual financial statements. In fact, it is generally not a report prepared for external users at all. So, who is it prepared for? The report is prepared primarily to help the management of a manufacturing business. The purpose of the manufacturing statement is to help management analyze their costs of production and use this information to effectively plan their future manufacturing so as to minimize costs and maximize profits. I'm going to show you the full format of the manufacturing cost statement further below, but before we look at the format, it's important to clarify the different types of manufacturing costs that we'll see there. 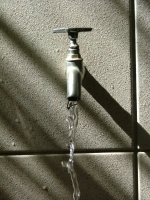 Direct materials are materials that are directly used in making the product. Also known as raw materials. For example, wood used to make tables or furniture. Direct labor is labor directly involved in manufacturing the product, such as a mechanic. 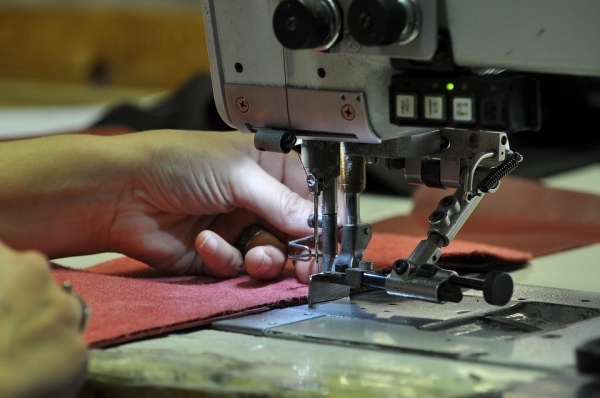 This includes people working with their hands or operating machines used to manufacture the product. Overheads are other general business expenses attributable to manufacturing the product. This includes rent (on the factory building), insurance (for the factory building or factory machines), and water and electricity (specifically for the factory building). If a business had a factory building and also an office building (where administrative work was done), the overheads would not include any of the expenses to run the office building - only expenses for the factory. The first two costs above taken together (direct materials plus direct labor) are known as the conversion costs of a product. Indirect materials are inventories that are used in the manufacturing process but whose cost is relatively insignificant. 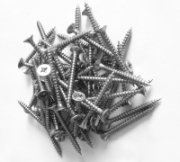 For example, in manufacturing a car, the nuts, screws and bolts would be indirect materials. Cleaning materials that are consumed in producing a completed, clean car would also be indirect materials. Indirect materials are recorded separately from direct materials, and actually fall under the category of overheads. Indirect labor is the cost of personnel not directly involved in manufacturing the product, but whose cost forms part of the factory expenses. 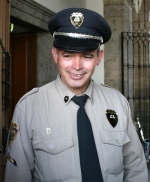 Included in this are wages and salaries to factory supervisors, cleaners and security guards. Indirect labor is recorded separately from direct labor, and, just like indirect materials, falls under the category of overheads. Work in progress are inventories that have started the manufacturing process but that are not yet finished goods. An example of this would be a car without an engine or fitted windows. Or tables that have been assembled but need sanding or finishing work. Raw materials are inventories that have not yet been used in the manufacturing process at all. An example of this would be the raw (untouched) steel used to make parts of a car, or wood to make a table. Raw materials are also called direct materials. Now if you're a bit confused looking through the above statement I don't blame you. It's not easy. You might be asking yourself how some of the above calculations in the manufacturing cost statement were obtained. For example, why are we adding opening work in progress and minusing closing work in progress towards the end of the statement? Don't worry, I'm going to explain these calculations in detail below. Our last formula above concerning work in progress completed (cost of finished goods manufactured) is a tricky one to locate in the manufacturing cost statement itself. If you look at the statement, “opening work in progress" and “closing work in progress" are right there (towards the bottom), but where is the “total cost of work in progress" this year? The answer is that this is equal to everything in the statement above the opening and closing work in progress. In other words, it's the total cost of direct materials used, plus the cost of direct labour, plus the overheads. This is the “total cost of work in progress" this year. The final line item in the manufacturing cost statement, the "cost of finished goods manufactured this year" is the exact same as the “work in progress completed" in the final inventory formula above. After all, when work in progress inventory are actually completed, they become finished goods - it's the exact same thing. So, that is why the manufacturing cost statement is structured the way it is - based on the above inventory formulas. If you refer back and forth between the inventory formulas and the manufacturing statement you should be able to get a basic idea of how the formulas are actually embodied in the statement itself. That's it for our lesson on the manufacturing cost statement. But you also just completed the final lesson on this site! But... that doesn't mean that you're done with accounting yet. It's something you do, not just something where you learn theory. So if you've not yet done so, you should start practicing accounting to make sure you not only know the theory, but can actually put this into practice. What I'm specifically getting into is that you should practice as many accounting questions and exercises as you can. Feel free to go through as many of these questions and exercises as you want. Would you like questions and exercises on every topic covered on this site (and more)? 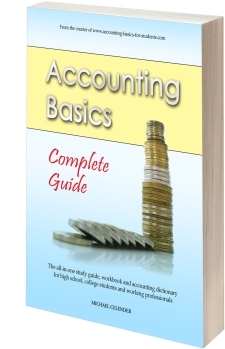 If so, check out our site's official basic accounting book - Accounting Basics: Complete Guide, a comprehensive book with lessons and questions for high school and college students (also good for working professionals who are reviewing the subject). It's now up to you to ensure you excel in accounting. Thank you for checking out my site and going through the lessons here. I hope they've helped make things a bit clearer. You're welcome to return here at any point. Wishing you great success in your studies and career!